The secret to keeping the floating bubbles in these champagne jellies is making sure your liquids are very cold, and cooling the mixture quickly so that the gelatin sets before the bubbles dissolve. Inserting the raspberry creates more bubbles, as the trapped gasses move around before the jellies are fully set. 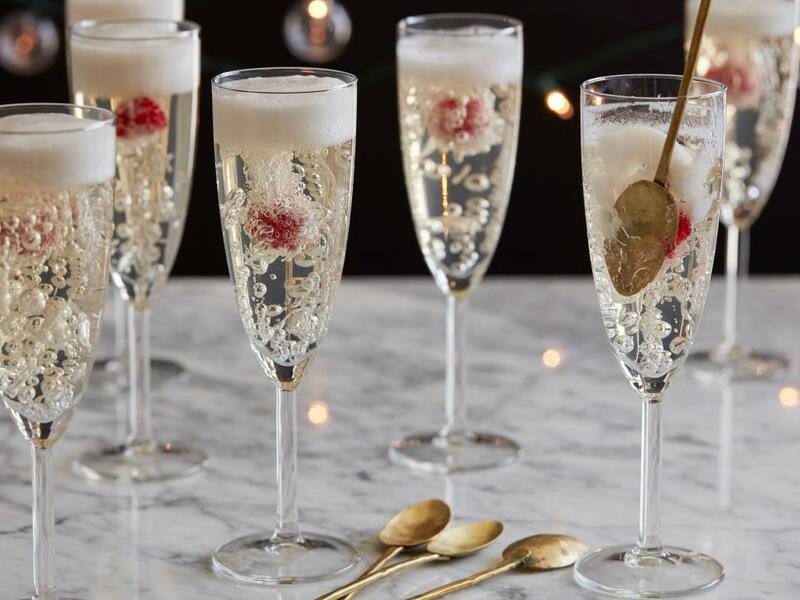 The result is a dramatic and festive sparkling treat best scooped with a spoon. Prepare an ice bath in a large bowl and set an 8-cup glass spouted measuring cup inside of it. Put eight 8-ounce Champagne flutes in the refrigerator to chill. Sprinkle the gelatin evenly over 2 cups cold water in a medium saucepan. Let sit until the gelatin softens (it will become translucent), about 5 minutes. Add the sugar then cook over medium-low heat, stirring gently, until the sugar and gelatin dissolve completely, about 5 minutes (don’t let the liquid come to a boil). Pour the gelatin mixture into the prepared measuring cup over the ice bath, stirring the mixture a few times until it feels lukewarm. Stir in the sparkling wine and grape juice. Pour 1/2 cup of the sparkling wine mixture into a small bowl then neatly pour the remaining mixture into the 8 flutes. Refrigerate the flutes and the reserved mixture in the bowl for 30 minutes (the jelly will be lightly thickened). Gently push a raspberry down into the center of each flute with a skewer, letting some gelatin cover it, until the raspberry is held in place. Add the half-and-half to the reserved gelatin mixture in the bowl and whisk vigorously until the mixture looks like foam. Spoon the foam on top of each flute of jelly. Return the flutes to the refrigerator and chill until the gelatin sets completely, about 2 hours.